At Mills Music Library, Box 4 of the Wisconsin Folk Museum Collection contains a folder entitled “Swiss Music Project,” 1986-1989, which includes biographical sketches of the musicians, letters, musical scores, press releases, notes, and the final report to the NEA. Other related materials are interspersed throughout the Collection. 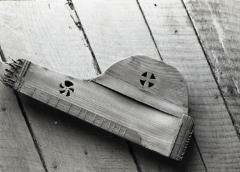 Handmade Glarner zither at Swiss Historical Village, New Glarus, Wisconsin, 1988. Photograph by Lewis Koch.